As the summer approaches, we look forward to meeting our Summer Camp Naturalists and seeing our youth camp counselors. These two positions work closely together, but have different responsibilities and we thought we would clarify those. Summer Camp Naturalists at Upham Woods are individuals who have earned at least sophomore standing in college. As a naturalist a person gets the chance to facilitate programs in canoeing, archery, fishing, swimming, arts and crafts, and nature center activities including live reptiles and amphibians. This seasonal summer position is also responsible for the supervision of campers and Youth Camp Counselors providing leadership and maintaining a positive and engaging environment. In addition, Summer Camp Naturalists get a chance to broaden their skills teaching natural programs, outdoor recreation and low ropes initiatives. Youth Camp Counselors help to provide support for campers ages 8-13. Youth Camp Counselors can be anyone ages 14-18 who are seeking to gain experience developing their mentoring and teaching leadership skills in a camp setting. 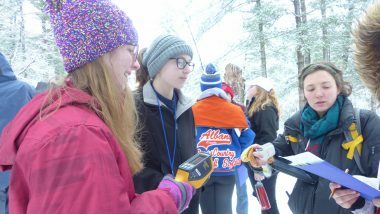 While providing support for campers, Youth Camp Counselors also get to participate in the Upham Woods recreational and educational activities. Youth Camp Counselors interested in coming to our open enrollment summer camp sessions are required to sign up for and to attend our training weekends, and we have our final weekend coming up April 27-28, 2019. Registration for that weekend can be found here. You can find more information on how to become a youth camp counselor and Summer Camp Naturalist position check out our website. If you have any questions give us a call at 608-254-6461. Check out the latest edition of our monthly newsletter series, Woods Writings!